With most observers predicting a holiday season on the subdued-and-sensible side, Toys R Us is hoping to encourage parents to go wild, with a new “Make All Their Wishes Come True” holiday campaign. The TV spots star a busload of kids -- almost 100, selected from New York City charity groups -- who think they’re stuck on a boring field trip. They are then unleashed in a Toys R Us and told they can have any toy they want. The ensuing bedlam, captured with GoPro footage and child’s-eye view camerawork, is intended to convey how the coolest toy can mean everything to kids. The campaign, from the Escape Pod Agency in Chicago, is also running online, as well as in print and radio. Digital strategy features high-impact home pages -- including MSN.com, YouTube and Yahoo, among others -- as well as in-app advertising. Experts are predicting a respectable retail season, and toy sales will likely gain as consumers continue to feel more confident about the economy. 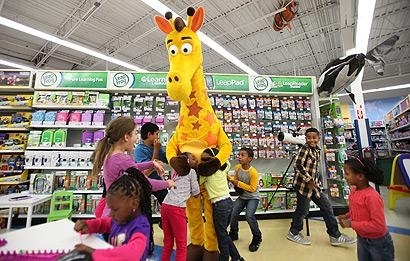 But the campaign comes amid some uncertainty for Toys R Us, which just officially tapped Antonio Urcelay as CEO. (He had been serving as an interim chief since May.) The company is debt-heavy, and has been criticized for generating just 10% of its sales online. That has become a liability in an omnichannel world, especially when online powerhouses like Amazon, Walmart and Target have become such popular toy destinations. NPD Group, which is forecasting more robust sales this year, says 31% of the people it surveyed plan to buy toys this year, about the same as last year’s 30%. But only 19% say they plan to shop at toy stores. 1 comment about "Toys R Us Unrolls #WishinAccomplished For Holiday". Sonny Cohen from Meet The Trees Foundation, November 18, 2013 at 9:20 a.m. The group most incensed and offended: parents and educators. How this could possibly drive business for Toys R Us is beyond comprehension. We consider this a major marketing #Fail on an international scale.